Cutting and sawing can produce challenges for tube and bar end finishing. 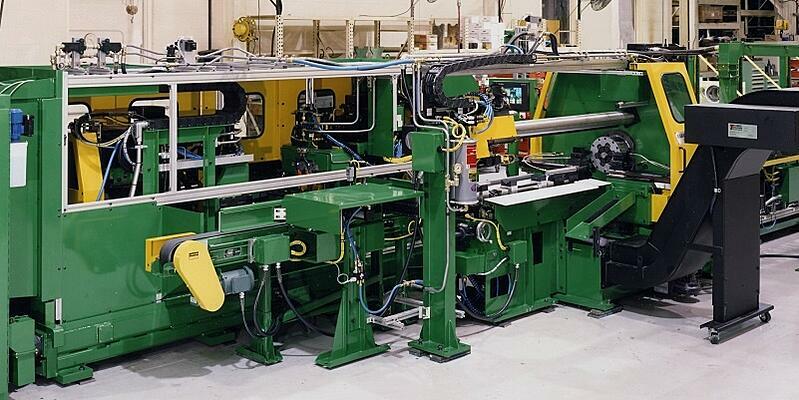 Our end finish machines tackle deburring, chamfering, facing, threading and more. Simply and easily connect a Bardons & Oliver tube & bar finishing machine to any Bardons & Oliver cutoff lathe or utilize for secondary operations on parts that are saw cut, roller cut or sheared. A chamfering operation may be required to simply remove the burr or to machine an actual specified chamfer on the O.D. and I.D. of the part. Bardons & Oliver’s single- or double-end chamfer machines can handle both. The multi-use machines can be equipped to chamfer, drill, center drill, turn, bore, thread, tap and perform other operations on cut bar stock or tubing parts. They can also be used for machining or deburring on both ends of forgings and castings. Expanding its usefulness, the machine can furnish tooling for any combination of tube & bar end finishing operations. Options like a cross slide for face milling and a crown turret for tool change capability increase production efficiencies. Material can load directly from the cutoff source via system automation/robotics integration or magazine-loaded by hand. Your finishing challenges can be met with our chamfer/end finish machines and systems. From simple deburring to complex chamfering on multiple ends, our tough, durable equipment meets your demands for quality and precision. Bardons & Oliver has been meeting your engineered challenges for more than a century. Our employee-owners find engineered solutions to the most complex challenges.